There’s a crisis of trust in politics across the western world. Public anger is rising and faith in conventional political leaders and parties is falling. Anti-politics, and the anti-politicians, have arrived. 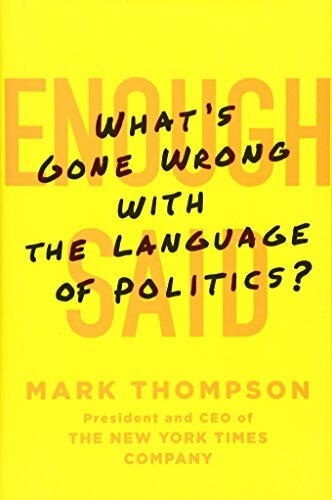 In Enough Said, President and CEO of The New York Times Company Mark Thompson argues that one of the most significant causes of the crisis is the way our public language has changed. Enough Said tells the story of how we got from the language of FDR and Churchill to that of Donald Trump. It forensically examines the public language we’ve been left with: compressed, immediate, sometimes brilliantly impactful, but robbed of most of its explanatory power. It studies the rhetoric of western leaders from Reagan and Thatcher to Berlesconi, Blair, and today’s political elites on both sides of the Atlantic. And it charts how a changing public language has interacted with real world events – Iraq, the financial crash, the UK's surprising Brexit from the EU, immigration – and led to a mutual breakdown of trust between politicians and journalists, to leave ordinary citizens suspicious, bitter, and increasingly unwilling to believe anybody. Drawing from classical as well as contemporary examples and ranging across politics, business, science, technology, and the arts, Enough Said is a smart and shrewd look at the erosion of language by an author uniquely placed to measure its consequences. View More In Legal Theory & Systems. If you have any questions about this product by St Martin s Press, contact us by completing and submitting the form below. If you are looking for a specif part number, please include it with your message.